Since I’ve been over in London, I’ve never left the flat without a scarf. They are a necessary layer – while it’s pretty chilly outside, it is SO hot inside everywhere due to no air conditioning in any of the buildings. This makes activities like the riding the tube unbearable if you’re wearing heavy clothing. That’s why I’ve learned to layer like a pro. My favorite Heidi Wynne scarf is the one I tote around most, but I’ve added a few new scarves to my arsenal since I wear them practically every single day. I love plaids and buffalo check prints for fall, so when I found a buffalo check scarf I snagged it! I love the pop of color it adds to my outfits while maintaining a seasonal appeal. I also recently grabbed this oversized geo-fringe scarf. It’s so cozy and the multitude of colors makes it easy to wear with pretty much any item in my closet. PS – this one is under $50! Also, I know I’ve mentioned my obsession with sleeveless turtlenecks on the blog this season, but they’ve really come in handy over here! Another amazing layering tool that allows me to stay cool even on the most packed tube rides. 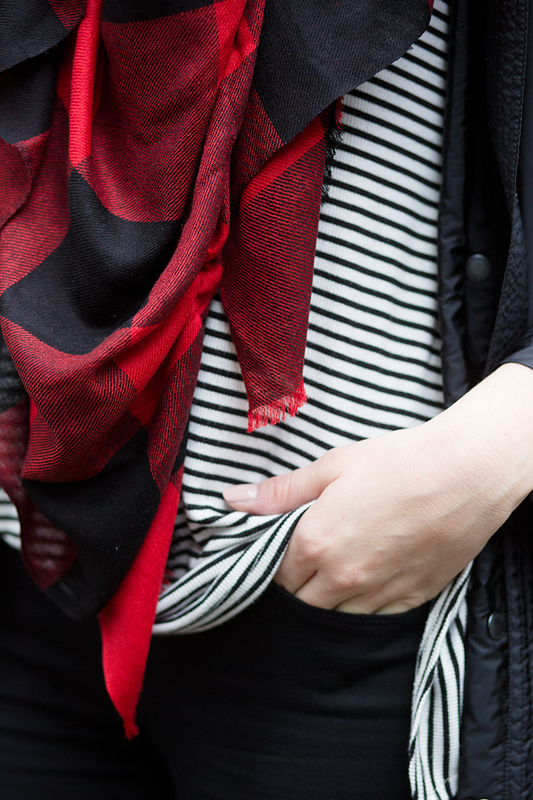 This striped one I found at the end of summer has been worn from Texas to Berlin – such a great staple! Love this jacket and this scarf is stunning against black. these photos are so gorgeous! 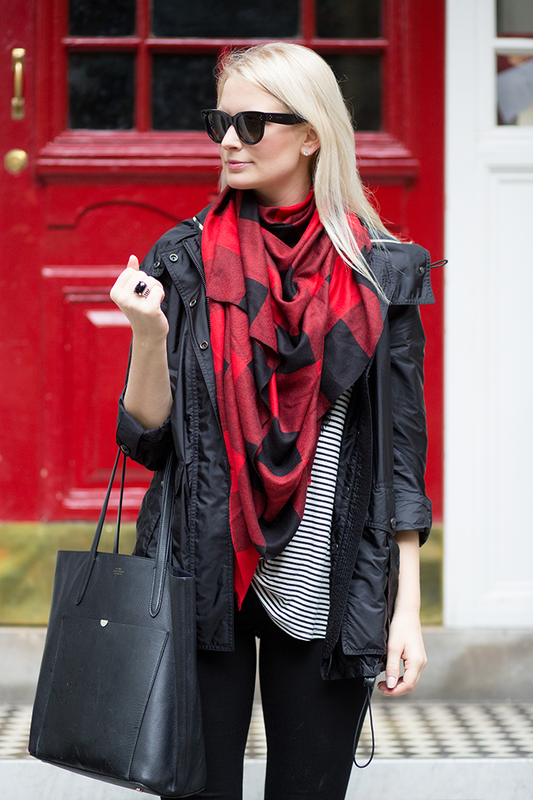 I have a thing for a classic buffalo plaid so naturally I adore that scarf! Perfect casual look – love the print mixing here! Wow, it sounds like the layers really are necessary without any AC. I love your scarf and stripe combo. Obsessed with that jacket… so cute! 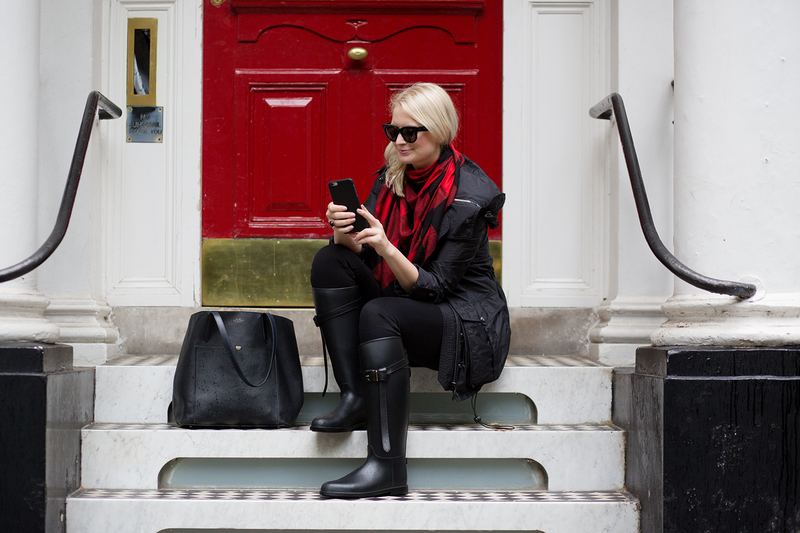 Nice rainy day look with your wellies and anorak! So chic. I’m still wearing short sleeves here in LA but am heading to Canada for the weekend and am so looking forward to scarves and light jackets! Love this entire look! How’s the sizing on the turtleneck, super brilliant! I’m headed to San Fran in early December and need to jump on my layering game, your tips are perfect. 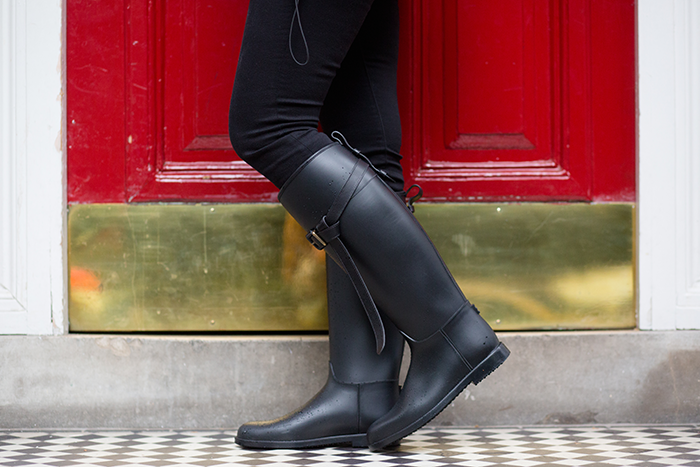 Great riding boots, Burberry always does it right! I’m having major boot envy! They are so sleek and classic! Such a great casual look! Love your buffalo check scarf and I’m coveting your Smythson tote and those Burberry boots!